The study found that there is a huge disconnect between what retirees think their children think and what the children actually believe. And, you might be surprised to learn that your adult children want to help. Ninety-three percent of parents think that it is unacceptable to become financially dependent on their children. However, only 30 percent of children feel the same way. And, 45% of parents and kids are out of sync about whether the children should help care for their parent’s health as they age. While it is clear that the majority of adult children of retirees want to help their parents, Fidelity found that the communications between the generations are not very strong. Estate: On the subject of estate execution, 92% of parents expect that one of their children will be the executor of the estate. However, 27% of the kids who were identified as taking on this role, were not aware that they had been designated. Caregiving: With regards to caregiving, 72% of parents believe that a child will take on long-term caregiving if the need arises. However, 40% of the children who had been identified by the parents as taking on this role did not know as much. In fact, only 43% of the parents in the survey indicated that they had had any kind of conversation with their children on the subject of long-term care. And, while long-term care is perhaps the most stressful subject to discuss, it may be the most important since it involves both involves both your health and high financial costs. Financial Management: Financial matters are no better. Sixty-nine percent of parents expect that their children will help manage their retirement finances. However, 36% of the chosen children did not know that they were expected to take on this responsibility. Family members worry about each other. Worrying is just part of caring for and loving each other. You might worry about who your adult children marry or the security of their job. And your kids worry about whether or not you have enough money in retirement. You might have to keep worrying about them, but you can help alleviate their anxiety by talking with them about your retirement. Ninety-three percent of children who have spoken with their parents about retirement plans feel better about the issues. And 95% of parents report feeling better as well. 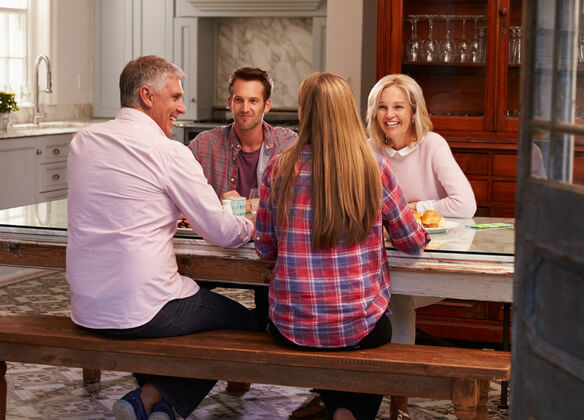 Having discussions about finances and how to handle things when you get older is not always easy, but your adult children want to have these conversations and as the study shows, they will pay off in the end. Some families have a tradition of family meetings. Others rely on random chats. However, these matters are serious and merit some degree of formality. Set Up a Dedicated Time: Talking about retirement and health issues is not something to bring up casually with your adult children or as a surprise. You should probably set aside a specific time — without distractions — to have these conversations. Consider a Mediator: If you have worked with a financial advisor or an estate planning resource, you might consider having them present to help guide the conversation with your children. Meet Often: This is not a one-time conversation. You should talk with your adult children before you retire, sometime around retirement and probably every couple of years while you are retired or anytime something specific changes. Prepare a Checklist: Make sure you document everything you want to cover with your children. Use Tools: Consider walking through your retirement plans with your kids using a detailed retirement calculator. This can insure you cover all the subjects and can help your children visualize your situation and where they might need to help. Be Clear: Know what you want your children to do or contribute and be clear with them. It is easier to have a conversation when you know what you want. Have Rules for the Discussion: Everyone has an opinion. The question is, what do you want to do about differing points of view. You are ultimately responsible for your life and finances, you do not need to be convinced of anything by anyone. Some experts have recommended a “voice not vote” rule for these conversations. Your children can have a voice, but not a vote for the matters that don’t impact them.